Lots of pics and words today, sorry! 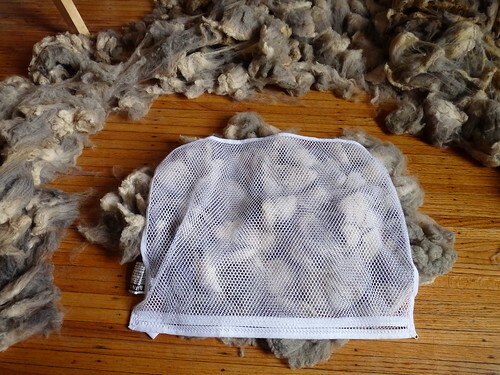 Cutting this post into two parts-- check back for carding and combing differences with the washed Romeldale later today. "A natural, raw wool cleaner that is free of enzymes, phosphates, peroxides and alkalis"
I use my mesh laundry bags as a guide-- I try and separate a piece that is larger than the bag on all sides, so when it's squished in there and wet in the wash, it doesn't float apart or lose how intact it is. Being very careful when loading and washing means that the formation will still be there to separate locks from it I wanted to comb/flick card it later. It is also very fast loading bags like this, especially with fleeces that want to stay together like the Romeldale does... I had these loaded in less than half an hour! After the Dawn-washed fleece was dry, I set out to wash the remaining half of the fleece in Kookaburra Woolscour. 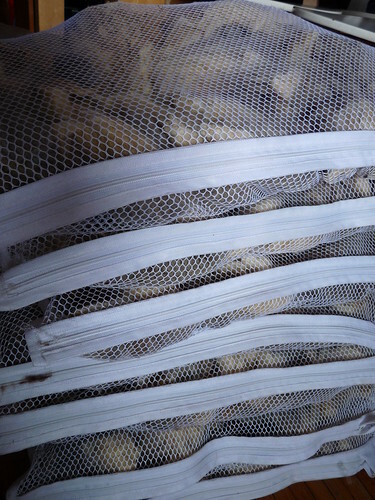 Kookaburra's instructions are simple-- use 1-2 ounces of Scour per pound of raw fiber. It was almost a little too simple for me :) since I feel most comfortable with my Dawn washing (several washes, several rinses)... and I didn't quite know how I could fit it into my washing routine. 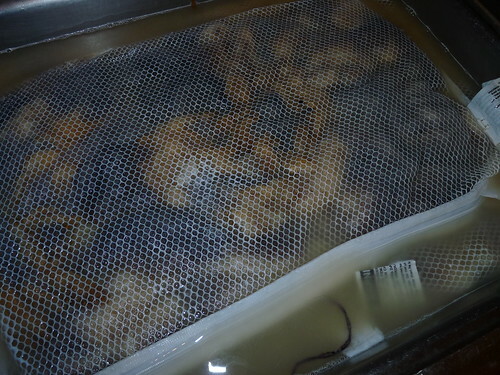 I had about 2 pounds of raw fleece left to wash, so I decided to use 1.5 oz of Kookaburra Scour total: an ounce for the first wash, a half ounce for the second, and two rinses. first wash-- see the yellow water? lanolin! I also decided to keep using an extra stockpot of nearon boiling water added to the sink for each Kookaburra washing-- I know from last time my tap gets to be about 135deg on its own, and I always use extra hot water with the Dawn and am happy with the result. I only used two plain water rinses instead of 3 I used for the Dawn-- Kookaburra says that rinsing is optional, but because I think the extra hot water of rinses helps melt any residual grease, I kept with it. Honestly I think even one rinse would have been adequate, the second had almost no lanolin clouding come off of the fleece at all, just clear water. I did notice, after the first wash in Scour, that after draining my sink had a discernable bathtubish ring. I've never had that happen to me but it was neat-- felt like a very soft wax, wiped off easily. I'm guessing that it was some of the lanolin carried off and away from the fibers by the Kookaburra Scour-- really interesting! It didn't happen after the first wash, either. The million dollar question-- how did it work? Going very carefully over the Kookaburra-washed fleece I did find one patch of locks that was slightly... draggy feeling, same as with some of the Unicorn when I did the same blind feel test. 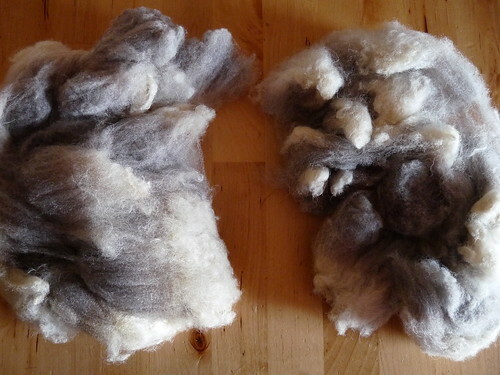 I am never so careful when going over dawn-washed fleece though-- I'm beginning to think there are a few locks that either don't get rinsed out totally or product is left behind when using any of them, probably including Dawn. It isn't enough to warrant rewashing, just a slight... drag and definitely not a dealbreaker (just honest). Kookaburra Scour's scent is really appealing-- I have no idea what it is ("all natural, plant-based") but it smells familiar and very clean. Since I rinse the fleece, no scent is left behind-- which is actually a plus because this Romeldale was so sheepy smelling and doesn't smell like ANYTHING anymore! Would I use it again? Definitely. I really do appreciate the concentrated aspect of Kookaburra Scour since I can use much less product weightwise (and throw away fewer packages) compared to the Dawn. I know that I can use less water rinsing the woolscour out than with Dawn; I have to use SO much Dawn that it takes many plain water rinses to let the soap out of the fleece, and avoiding that is a good thing. 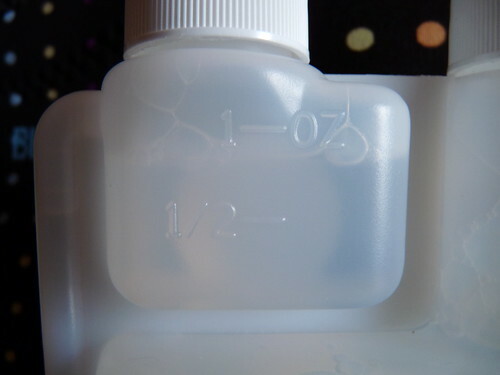 Kookaburra Scour is also economical in actual product cost-- I used 1.5 oz for 2 pounds of fleece; the 16 oz bottle retails for $10.95 so it cost a whopping $1.03 to wash the 2 pounds clean. (If I used 2 ounces like I should have according to the package, it would have cost $1.37.) I didn't weigh the blue Dawn I used this time, but I'm 99% sure it was actually cheaper to use the Kookaburra as compares to the Dawn-- which I find mindblowing for a specialized fiber product. Another plus is that Kookaburra is already widely distributed in local yarn/specialty stores (my favorite bay area yarnstore, Article Pract, carries Kookaburra Wash), so I'd guess that you could ask your LYS to order it for you and support them with your purchases at the same time. 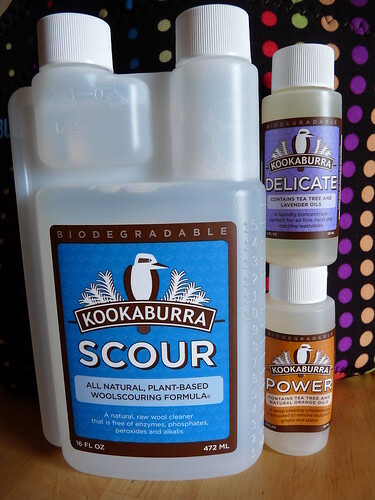 If you don't have an awesome LYS like I do, you can purchase the scour direct from Kookaburra Co.
Kookaburra Wash has been my favorite woolwash for a long time, and I'm excited to have found another excellent specialty fleecewash from them I can continue to use and enjoy. Dude! This is totally incredible. I bow in awe of your knowledge, Obi Wan. We at Kookaburra would like to thank you for your awesome review!We truly believe in our products and stand behind them 100%. We were thrilled when we found your review of our Kookaburra Wash on your blog site and are equally delighted to read how our Kookaburra Scour held up to your testing. Its shearing time this week, and I will have 18 greasy mohair fleeces to get through (not to mention all the others I've procrastinated on from past shearings) and I remembered seeing this before. Thanks for the review, will definitely hunt me up some of this!